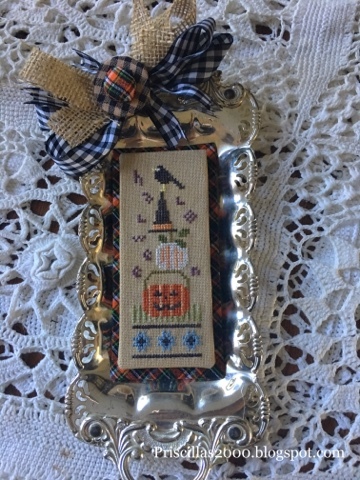 This little tiny piece is from Lizzie Kate's Autumn smalls..This is another of my daughters pieces that I finished for her. 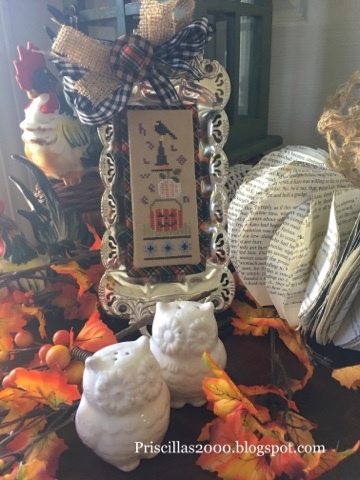 She found this silver tray ( maybe a butter dish) at a Good will.. this little piece fits perfectly in it! 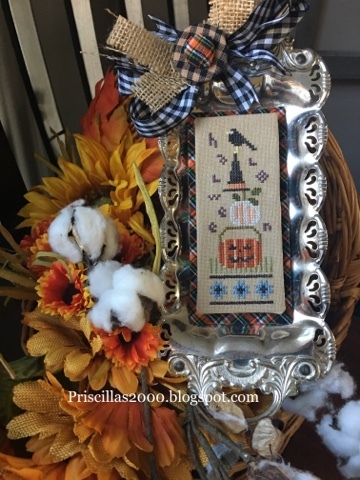 I used a Halloween colored plaid homespun for the back ,that I mounted on sticky board. I also mounted the stitching on sticky board. Then hot glued the 2 pieces together...I made a bow from burlap, and black gingham check.. Then added 2 covered buttons to the middle of the bow..It is very cute but tiny! What a great finish for a cute little design! Lovely stitching and finish. It's such a treat to come and visit each day to see all your loveliness. Thank you. Great job on this little cutie!